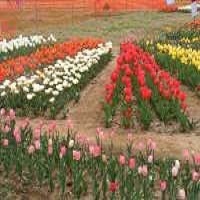 Indira Gandhi Tulip Garden is situated at the foothills of Zabarwan Mountains, which is near the banks of Dal Lake. This garden is around 8 km from Srinagar and is known for annual Tulip Festival that continues for 7 days. It is one of the spacious gardens in Srinagar and is known to have more than 70 varieties of coloured tulip flowers. The garden covers approximately 90 acres of land and houses 1.3 million tulip bulbs that overlook the Dal Lake. It is situated in vicinity of Shalimar Garden, Nishat Garden, Chashm-e-Shahi Gardens and other Mughal Gardens.